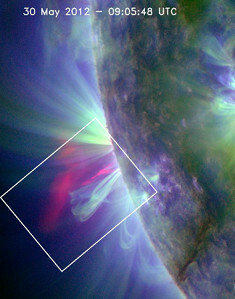 Figure 1: Composite RGB image at 131Å, 171Å, and 193Å, showing the limb active region some minutes after the flare. The bubble of plasma is well seen in the red channel (131Å), where as the coronal loops are visible in the green and blue channels (171Å and 193Å). The Solar Dynamics Observatory (SDO) mission has improved our view of the Sun thanks to the striking images from the Atmospheric Imaging Assembly (AIA). It is able to take snapshots of the full Sun every 12 seconds at several Extreme Ultra-Violet (EUV) wavelengths, with spatial resolution of 0.6″ per pixel (about 435 km) . Because of its capabilities, AIA is suitable for detailed studies of the dynamics of coronal loops in active regions. Coronal loops appear as bright EUV arcs, whose footpoints are fixed in the lower layers of the solar atmosphere, and can exhibit transverse displacements, which are also called kink waves [2,3] (for more details see also nuggets #17 and #33). Kink oscillations are usually triggered by impulsive releases of energy, such as flares or CMEs, and experience a strong damping in time, so that oscillations last for only about three/four periods. Here, we present observations that do not match the standard picture of coronal loop kink motions, but the presence of weakly decaying kink oscillations (that we define as “decayless”) is shown. We studied the loops of active region NOAA AR11494 observed on the 30th May, 2012, between 08:00-11:00 UTC, located on the south-eastern solar limb. The coronal loops of interest are enclosed by the white box in Figure 1 and mostly visible at 171Å, 193Å (0.8-1.5 MK). A close-up of this region is shown in the movie in Figure 2. At 09:00 UTC a flare (which is also clearly seen from STEREO-B) induced the emission of a hot bubble of plasma, visible at 131Å (T ~ 10 MK), which triggered standing kink oscillations decaying within 20 min. 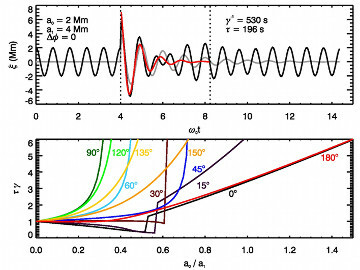 However, a careful inspection of the movie in Figure 2, shows that before the flare some loops exhibit steady oscillations but of smaller amplitude (see the expanding loop on the right, outlined by a moving slit). Figure 2: Movie showing the temporal evolution of the active region: the left panel is a RGB animation, the middle one shows the loops at 171Å only, with the expanding loop on the right overlaid by a red slit, moving with its apex, and finally the associated time distance maps in the right panel. Figure 3. Left: 171Å image of the loop system with vertical and horizontal slits. Right: time-distance maps taken from the middle and right-hand vertical slits (top and middle panels) and the top horizontal slit (bottom panel). The dashed black boxes round some typical oscillations, which are fitted by the red line. We took vertical and horizontal slits as shown in Figure 3, in order to determine the intensity variation from and depict the oscillations in time distance maps. 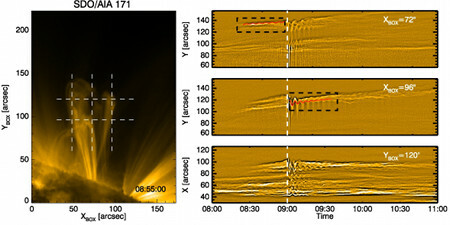 A decaying wave-like pattern is evident after the white dashed line which marks the time of the flare occurrence. Before, as well as after the decaying regime, some small amplitude oscillations are present. We extracted time series of the position of the oscillations and fitted them with a sinusoidal function (eventually weighted by an exponential factor to describe the decay). For all of these oscillations we estimate a period of between 3-5 min, and a decay time of 8 min for the impulsive oscillation. We focused on the expanding loop on the right side of the system: its dynamics are well represented by the time distance map, constructed from a slit which is following in time with the top of the loop (see the movie in Figure 2). We defined three phases: the first one in which the loop experiences low-amplitude oscillations without any clear damping; the second with larger oscillations triggered by the flare, whose amplitude then decreases over a few minutes; and the final phase again of low-amplitudes decayless displacements. an impulsive high-amplitude driver (like the flare in our observations) of amplitude a1, starting at a specific time. Figure 4. Top: A numerical test of displacement as a function of time due to a harmonic low-amplitude and impulsive large-amplitude signal. Shown is the combined signal (black lines), impulsive only (grey line) and fitted damped oscillation (red line). Bottom: τγ as a function of the ratio of amplitudes a0/a1 for various phase differences. The contribution of the two drivers is evident in the numerical test displacement shown in Figure 4 (top): the black line is the displacement due to both the harmonic and impulsive drivers and the grey line is the purely impulsive part. During the impulsive phase the combined signal (black line) is fitted by a damped oscillation (red line). This does not match the impulsive driver (grey line) indicating that the combined effect of the harmonic and impulsive driver is such that a beat appears within the damping phase, and the fitted damping time τ is an underestimation of the true damping rate γ. The exact duration and the magnitude of the decrease in the oscillation depends on the amplitudes of the two drivers a0, a1, and γ. Figure 4 (bottom) shows how the damping time τ changes with respect to γ as a function of a0/a1 and for several phase difference values. At small phases (less than 50°), the damping time will be shorter than γ-1, but it will experience a jump in amplitude ratio at around 0.5, causing an increase of τ. The driver of the small-amplitude oscillations remains to be addressed and it should have an intrinsic period of 3-5 min. One candidate with the correct periodicity are sunspot oscillations. These are interpreted as slow magneto-acoustic waves propagating away from sunspots detected via Doppler shifts of photospheric lines as well as EUV intensity oscillations . Other mechanisms could be unresolved footpoint motions, effects due to granulations, or periodic Alfvénic vortex shedding caused by the relative motion of the loop with respect to the background plasma . More details about this nugget can be found in . Other studies interpret spectroscopic signatures of Doppler shifts as continuous kink waves in coronal loops  or show an example of loop subject to a gradually growing kink oscillation . Thus, considering these different scenarios, there is a need for systematic studies of loops in order to reveal more about their complex dynamics and response to nearby changes in the corona.